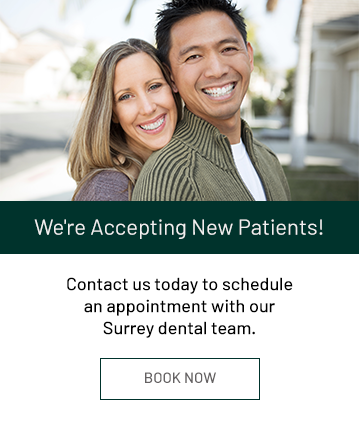 At Guildford Smiles Dentistry in Surrey, our dentist, Dr. Marwa Salman, is always happy to welcome new patients into our dental family. We look forward to meeting you! We understand that most patients would rather be somewhere other than the dental chair – maybe even anywhere else. Our mission is to turn those negative feelings into positive ones by providing you with high-quality care with a friendly, personal approach. Even if you are fearful about visiting the dentist, we are committed to learning how we can help you relax and even enjoy your dental appointments. Your oral health plays a role in your overall health, and we are pleased to be part of your essential healthcare team. Even if it has been a while since your last dental visit, we will help you catch up on your oral health without guilt or judgment. During your first visit with us, we ask that you arrive 10 - 15 minutes early, so that you can fill out your medical and dental history forms. After your forms are complete, you will have a consultation with your dentist, during which you will review your forms with her, and discuss your dental health needs and goals. You can ask your dentist any questions you may have regarding your dental health at any time during this appointment. Next, your dentist will perform a dental examination and cleaning, and take some digital x-rays, to establish a baseline for your oral health. She will be happy to work at your pace, and will be attentive to your comfort throughout the process. Once your initial appointment is complete, any follow up appointments can be booked with our receptionist at the front desk. We offer payment options, including dental payment plans via HealthSmart Financial Services, that make getting the dental care you need easy and convenient. Below, you will find our office policies on payment for your care. We work with all insurance companies to maximize your benefits.